Two Storied Girls Lacrosse Programs will battle it out next Tuesday, April 24th @ Ward Melville High School. The Northport Tigers head east to Setauket to take on the Ward Melville Patriots. Both Class A teams come into the contest undefeated with 7 -0 records. When interviewing the coaches; Coach Carol Rose of Northport & Coach Kerri Kilkenny of Ward Melville for the Long Island Lacrosse Journal, both coaches were asked what game should FLG Cover for the String King Game of the Week. Both coaches said Ward Melville & Northport respectively. This is game you won’t want to miss. Leading the Lady Tigers offensively so far this year is Junior Duke Commit, Olivia Carner with 30 Goals & 13 Assists. Carner is dynamic, making plays all over the offensive half. Northport does not just have one high level player; they boast four other D-1 Recruits. 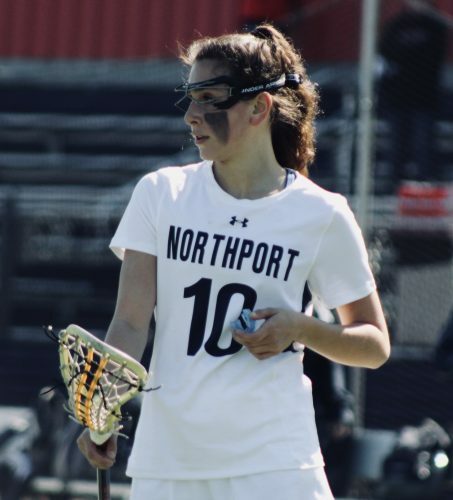 Two Florida Commits follow Olivia in the scoring column, senior, Emerson Cabrera (17 Goals 9 Assists) & sophomore, Danielle Pavinelli (23 Goals & 7 Assists) are huge contributor to Northport’s early season success. Senior, Nicole Arella (Michigan Commit) round out the fierce Tiger Offense with 5 Goals & 5 assists so far this season. A future Buckeye, junior goalkeeper Claire Morris has 47 saves in her first 7 games this year, leading a stingy defense into the Setauket Squabble. Olivia Carner, Duke Women’s Lacrosse Commit, is lighting it us this season. She leads the team in goals and assists. Can Carner carry the Tigers to the top in 2018?! This game should shape up to be a great one as Ward Melville equally combats Northport skill. Leading the Lady Patriots on the offensive side of the ball is senior, attacker Kate Mulham, Princeton prospect with 23 Goals & 4 Assists on the year. Other lady laxers’ leading the Patriot “O” is Jillian Becker, senior Richmond Spider Commit (14 Goals & 2 Assists), Shannon Brazier, senior Cornell Big Red Commit (10 Goals & 4 Assists) & Shannon Berry, senior Princeton Commit Midfielder (8 Goals & 1 Assist). Coach Kilkenny’s defense is lead by senior Shannon Coughlan who is heading to New Haven Ct next year to play for the Yale Bulldogs. Who do you think will come out victorious?